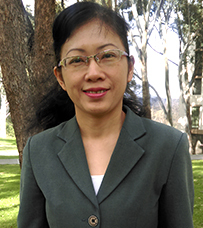 Carolyn Tran is a Lecturer in Economics, specializing in the area of Applied Econometrics, Education Economics and Development Economics. Her research activities have focused on efficiency analysis of Education, Public Policy Analysis, and Applied Econometrics. She has published in referred international journals. She was formerly a Vice Rector of a Vietnamese College and a Consultant for a World Bank project. Development economics and evaluation of economics efficiency of regional development, provincial public administrative index and competitiveness capacity. Efficiency and productivity analysis; education economics, development economics; applied econometrics; public policy analysis; competitiveness capacity, public administration and socio-economics. Tran, C-D.T.T., & Villano, R.A. (2018, forthcoming). Financial efficiencies of Vietnamese public universities: A second-stage dynamic network data envelopment analysis approach. The Singapore Economic Review. Tran, C-D.T.T., Crawford, M. & Villano, R.A. (2017). Efficiency-based ranking: A case of Vietnamese public universities. Asia-African Journal of Economics and Econometrics. Tran, C-D.T.T., & Villano, R.A. (2017, forthcoming). Environmentally-adjusted efficiencies of Vietnamese higher education institutions: A bootstrap multi-stage DEA method. International Journal of Operational Research. Tran, C-D.T.T. & Villano, R.A. (2017) Input rigidities and performance of Vietnamese universities. Asian Economic Journal, 31(3), 253-273. Tran, C-D.T.T., & Villano, R.A. (2017). An empirical analysis of the academic performance: The case of Vietnamese higher education institutions. Journal of Further and Higher Education, 41(4), 530-544. Nguyen, H.D. & Tran, D.T.T. (1999) Economics and health consequences of pesticide use in paddy production in the Mekong Delta, Vietnam. EEPSEA Research Report Series. Economy and Environment Program for Southeast Asia. Tran, C-D.T.T., Crawford, M. & Villano, R.A. (2016). Reform process and the productive efficiency of Vietnamese higher education: A case study of public universities, presented in Vietnam Forum 2016 “Vietnam: Thirty years of reform and beyond”, Invited paper, IDEAS in Singapore, 7-8 April, 2016. Villano, R.A. & Tran, C-D.T.T. (2015). Measuring inefficiency in Vietnamese private universities: An application of bootstrap directional distance approach. The 13th International Conference on Data Envelopment Analysis, Braunschweig, Germany, 24–28 August, 2015. Tran, C-D.T.T., Villano, R. & Battese, G. (2014). Performance of Vietnamese higher education institutions in 2011/2012: Using data envelopment analysis approach. The 12th International Conference on Data Envelopment Analysis, Kuala Lumpur, Malaysia, 14–18 April, 2014. Tran, C-D.T.T. & Crawford, M. (2015). Vietnamese Higher Education: Characteristics and Challenges. The project of Vietnam 2035. The World Bank. Tran, D.T.T. (2010). Evaluating companies' satisfaction on Sonadezi College's students as in-job trainees. College Project, Sonadezi College of Technology and Management (SCTM). Tran, D.T.T., & Luu, P.D. (2009). Project of upgrading Sonadezi College to Sonadezi University. College Project, SCTM. Tran, D.T.T. & Chu, T.T. (2005). Project of establishing Sonadezi College of Technology and Management. Corporate Project, 2979/QĐ-BGD&ĐT-TCCB, 1/06/2005, Ministry of Education and Training. Acted as examiner of Honours and Master theses. Efficiency and performance analysis of education, public government, human resources, manufacturing and service sectors. Effectiveness assessment of development projects and socio-economic studies.